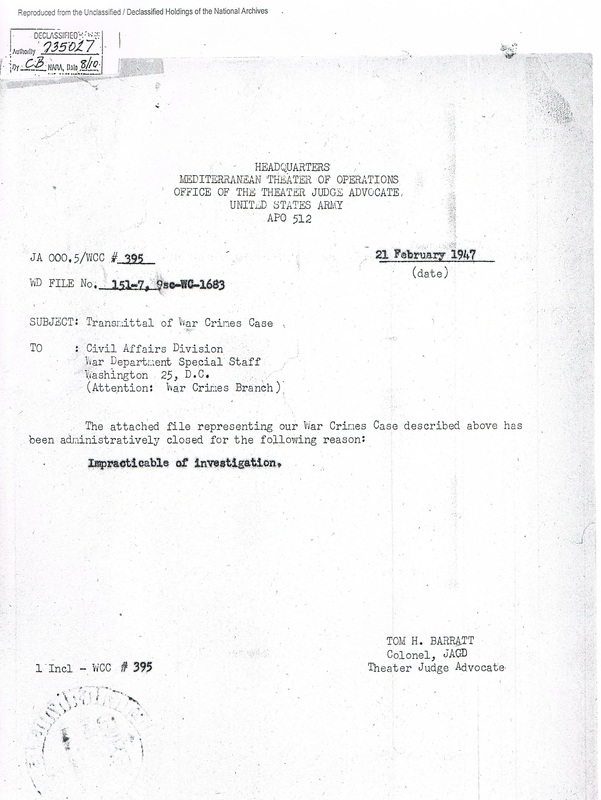 From the material within the folder it appears that the earliest recorded attempt to find out what had happened at the Ponte di Paglia was on 13 April 1944, when the Swiss Federal Political Department, Foreign Interests Division, in Berne, acting on behalf of the British Legation, sent a note verbals no. XVIII/43/44 by telegram to the German Foreign Office. Acknowledgement of the receipt of this communication did not come through until 31 August. On 22 June, just eight days after the front had passed Orvieto, Lieut. Col. Hollinghurst RAMC sent a memorandum to A Branch, HQ Eighth Army, to the effect that the Director of the Civil Cemetery had reported to him that Privates Asser and Fusiliers Patrick and Chadwick had been interred there after dying in the city's civilian hospital from from wounds sustained in the bombing. Other information about the bombing was beginning to filter through to the authorities via the debriefing reports of those escapees from the train who had joined the Allied Lines. 7676195 Private C. F. Morris RAOC was interviewed on 29 June and D/JX.302102 Able Seaman Arthur Melling on 5 July. On 11 September 1944 Lt. Col. N. S. Dean, commanding 2 Army Selection Training Battalion in Leeds, received a letter from the Under Secretary of State for the War Office (Casualties) requesting that he interview 14588637 Private A. Betts, 14556021 Private R. Patrick, 4987090 Private F. Crane and 4029522 Lance Sergeant A. Rees, about missing soldier 4808182 Corporal W. Dowse, a former colleague of theirs in 6 Lincolnshire Regiment who had been captured with them on the 21 December 1943. The four had escaped from the train, had avoided recapture, and were back in service in Leeds. They reported what they knew on 14, 15, 18 September and 7 October respectively. 14515613 Fusilier John Kean 2 Royal Scots Fusiliers gave his testimony, also in Leeds, on 17 September. They were the first of a large number of men who were asked to give evidence about missing men who were known to have been on the train. Through the channels of of the International Red Cross in Geneva, men being held in POW Camps in Germany were being asked to supply information. For example, 647266 Trooper B. A. Beard of 46 Recce was questioned about Trooper George Arthur Gibson, who was still classed as missing. (Gibson gave evidence to the enquiry on 22.12.1944.) Some evidence was still being collected as late as July 1945 from men who had just returned to the United Kingdom from prisoner-of-war camps in Germany. Identity discs, relating to 196067 Pte Thomas J.G., and personal diary of “Albert Roberts”, the enclosures referred to in the above-mentioned letter, are sent to you for disposal. These soldiers cannot be identified from records held at this HQ. The identity discs and personal diary mentioned in the above, are enclosed. SS/514 Cas/PW Restricted reference memo AA1/5074/A/PS 8/8 addressed to you what steps have been taken to identify and recover the bodies before flooding of the river makes this impossible. Matter very urgent. Your 33700 (Cas.PW) Sep.13 Enquiry passed to Graves Service. Latter to reply to you direct. With reply (crossed out in ink and substituted with reference) to the attached copies (crossed out in ink and substituted with correspondence), and diary, “Albert Roberts”, would appear to be No. 4197747 Fusilier Benjamin Roberts, recorded here as missing believed Prisoner of War in Italy. We will inform you if necessary of any further information received from O2E Central Mediterranean Force. The only other reference to Fusilier Roberts is in WO 361/668 and is to be found on an unnumbered typed sheet entitled 'Acceptances on bombed train'. It gives his regiment as 9 Royal Fusiliers, notes that he was reported missing on 16.12.43 and states. Accepted K. I. A. 28.1.44 while P.W. Cat-B. (body found). It would seem that the two bodies found and interred by 160 Bridging Company were never recovered by the War Graves Commission. Fusilier Roberts has no known grave and is remembered on the Cassino Memorial. 196067 Private Johann Thomas, South African Police Brigade, was admitted to hospital in Orvieto with bruising to his right foot and was sent on to Stalag IVB Mühlberg/Elbe. The real name of the dead soldier who was wearing his identity disc will never be known. The Missing Persons Inquiry conducted on behalf of the Union Defence Force (UDF - South Africa) is also held in the National Archives Kew in Record WO 170/8910. The inquiry seems to have commenced on 13 November 1945 with a letter from the UDF ADMIN HQ (MAIN)	CMF to the Graves Records Office, which at that time was based in Naples, asking for information about two missing Native South Africans, 6021 Pte Elias Velapi Nggobo and N. 876 Pte Jim Nohabe Malaka In contrast to the British inquiry, emphasis was put on visits to the bridge and on interviewing as many eye-witnesses as possible. It is from the evidence in this report that a clearer picture emerges regarding the dynamics of the incident. 1. "I visited the scene of the disaster and found that for many hundreds of yards around the bridge the ground is pitted with large bomb craters, and apart from an isolated grave in on of the craters there are no signs of the graves of the victims. I questioned the local inhabitants who stated that: the bridge had in all been heavily bombed 72 times and also that the parish priest of MONTERUBIAGLIO, a nearby village, had some knowledge of the matter. I therefore visited him and he told me that the train originally contained about 1,000 prisoners of war, English, South Africans and French, who were taken prisoner in TOBRUK and were on their way to ROME. When the planes came over, the train was halted on the bridge, and during the bombing was destroyed and left burning. About 400 were killed all these were buried by the priest with the help of the local folk in a common grave beside the bridge. Since then however, the bridge has been bombed many times and now there is no trace of the grave or any of the bodies it contained. He told me also that the wounded were taken to ACQUAPENDENTE and ORVIETO so I visited these two towns with the following results. At ORVIETO 105 P's.O.W. were admitted to the civil hospital where some died and were buried in the Civil Cemetery. The others, after a few days, were removed to the German Military Hospital nearby. The hospital has a record of the names of the P'S.O.W. and gave me a copy which I attach. Those who died and were buried in ORVIETO Civil Cemetery have been registered – see GR. No's. 22/ SMG/2107/-8-9-10 and the correspondence attached thereto. From ORVIETO I went to ACQUAPENDENTE and saw the authority of the Civil Hospital but they were unable to give any information at all, since the wounded, they told me, had been taken to a German Military Hospital in ACQUAPENDENTE. In ACQUAPENDENTE Civil Cemetery is one grave of a P.O.W. registered previously on GR/22/SHC/2081 but it is not known if he was a victim of the accident. 2. It will be appreciated from the above report that this office cannot confirm the death of either of the two above named as it is thought possible they were both killed outright, especially in view of the fact that the records of the Civilian Hospital at Orvieto have been diligently searched but no trace was found of these two above ever having been admitted. 3. Instructions have been received in this office from the H.Q. of this service that no further action is being taken in this connection. Copy of their letter is attached for you perusal. I proceeded to ORVIETO on the 29/1/46 and visited the Civil Hospital where the wounded in the above bombing were admitted. I looked through the hospital records of the personnel admitted, but none of the names on my list are reflected in the hospital records. I then proceeded to the scene of the bombing, and whilst wandering around the bridge questioned certain of the labourers engaged on the construction of the new bridge. I asked if they had come across any more bodies lately whilst digging around for stone etc., and I was informed that two bodies had been found and re-interred, one they think is British, as the boots were recognized as those worn by the British Army, the other body was that of a German Sgt. Major, also they were able to identify him through his disk. I then went to see the engineer in charge of the bridge construction this gentleman took me to the two graves where they had re-interred these two bodies. He also took me to a bomb hole and told me that this was a communal grave where 60 bodies had been thrown in, amongst which were a number of natives. This was done in a great hurry by Italians whom the German collected from two nearby villages, all these bodies were buried without being touched or searched, this being due to the fact that as the bridge was being bombed daily the work was done as hurriedly as possible. I was taken to another place where they had struck a heap of bones and bits of clothing, this being the remains of P's.O.W. who jumped off the train that was on the bridge and killed themselves on hitting a jutting out concrete ledge. Some of the Italian workmen who are engaged on this work were amongst those who helped to bury the bodies. I have contacted the Graves Commission, ROME and they will have these places indicated by me dug up, and any bodies found will be re-interred in a Military Cemetery. I shall accompany the Graves personnel for identification purposes, this will be on or about the 15 inst. when I shall forward the results of the search. There is every possibility that many of the unaccounted native P's.O.W. that were in this bombing raid will be accounted for. On completion of these briefs I shall forward individual reports. 1. As instructed by you I made a full and thorough investigation of the location at Sheet 130 - 401655 and stayed there with two Sections from 13th - 20th February. 2. A new and large bridge is now being built at the location by a Civil Engineering Firm. New Railway embankments are built up north and south of the river needing 1800 cubic metres and 2400 cubic metres of ballast respectively. The ballast is taken from the river bed east of the bridge thus offering the first real opportunity for investigation of rumours of mass burials in bomb craters. 3. I received every assistance and help at the location from the chief engineer and all his authorities and am certain that a further stay would serve no purpose. a)The area is bombed to such and extent that not a square yard had been left undisturbed. The R.A.F. could confirm the story of the Civilians that the bulk of the bombing took place after 28.1.44 the day of the train disaster. found lower than about three inches below the surface. This area was completely moved and about 400 cubic metres of earth carted away by narrow gauge trolleys. III A solid concrete parapet blown off the NORTH and West of the bridge. c) The area up to about 100 yards EAST of the bridge contains a very large number of scattered bones – mostly fragments except for whole finger and toe bones and some vertebrae. These bones are on or just under the surface. They do not constitute bodies in any way. Under the rubble of the old bridge an obviously Arab-made crudely inscribed 17785 EDWARD K. C.E. was found. b) the widely scattered bones could not be accounted for satisfactorily in any other way. 6. There is a possibility that the construction work now going on may reveal some single or multiple grave but chances diminish as the removal of ballast from the river bed moves more and more to the EAST. The casualties obviously would be buried near the bridge. Details obtained from Civilians regards events on the 28th January 1944 and corroborated by independent witnesses or local conditions. 1. On the 28 Jan. 1944 at about 1100 hrs a train consisting of about 35 goods wagons and some passenger coaches was passing from SOUTH to NORTH on the PAGLIA BRIDGE. 2. The engine was an Electric Tractor. The first few carriages contained civilians. The goods wagons were sealed and carried besides a number of Allied P's.O.W. (variously estimated as between 500 and 600 by the more reliable witnesses) also Italian and German Military Personnel and ammunition. EVIDENCE:- The Electric Tractor Engine is still on the embankment. Splinters from Artillery ammunition – not A.A. Ammo. 3. During the train's passage an Air Attack developed and as the engine reached the embankment NORTH of the bridge either bomb splinters or machine-gun fire stopped her. The Air Raid was intense and the train received some direct and near hits. Some carriages caught fire, others exploded and others were bodily blown off the bridge. EVIDENCE:- State of the locomotive later pushed over the embankment to free the line. Pieces of obviously exploded goods wagons flung up to 100 yds from the bridge. Paint on some wagons blistered and other woodwork charred. 4. The reconstruction of further developments is based somewhat on conjecture. A panic seems to have broken out. An Italian official opened some of the sealed carriages. A large number of P's O.W. Escaped, some jumped over the bridge. Some were burned to death and many must have been killed by the explosion. The river at the time must have been high as it was a very wet winter, so it is safe to assume that many drowned and a number of otherwise killed were washed away. EVIDENCE: The Manager of the ALBERGO PALAZZZO in ORVIETO states the name of the Italian official and has given the details to the MPIB representative. Several farmers in the hills SOUTH affirm that large numbers of white and also some coloured Allied P's.O.W. passed through on this day and the following days. Other details stated by three or more independent witnesses as far as they coincide. 5. After the raid the area was cordoned off by the Germans. Civilians were ordered to collect what bodies there were. They were buried hurriedly near to and EAST of the bridge mostly in bomb craters. Owing to fear of further raids the nationalities were apparently not sorted out. The wounded – over 100 - were brought to Orvieto for treatment. Bombing of a P.W. train at 'PONTE DI PAGLIA' near ORVIETO on the 28 January 1944. Italy 1:1001000 Sheet 130. M.R. :4559. Reference GHQ/2382/3/836/A-4 of 31 January 1946. As instructed I proceeded to the ORVIETO area and the scene of the PONTE DI PAGLIA disaster in order to obtain complete details of this tragedy and to ascertain if graves of unknown soldiers could be located. I first proceeded to PONTE DI PAGLIA (MR: SU: 130-401644 - ITALY 1:100,000) where a G.R.& E. Unit (No. 19 Field Unit) commanded by Captain O. CAMMERLOHER was excavating. (Appendix K). This officer informed me that, in spite of very extensive excavations, nothing but pieces of bones had been found, and that in his opinion it was a hopeless task to try to identify any remains. In order to understand how it was possible for probably over 400 bodies to disappear, leaving nothing but pieces of bones a few inches long, I think it is necessary to relate in full, what actually happened on that fateful day 28th January 1944. I have been able to piece this narrative together from statements taken by me from various eye-witnesses (Appendices A to L). On the 28th January 1944 at 12.30 hours a train consisting of one electric traction engine, one passenger coach for the German O.C. troops and his staff, two freight cars loaded with Italian civilians and a great number of padlocked box-cars containing Prisoners of War who were en route for 'FIRENZE' (Florence) from FARA-IN-SABINA (Map Ref: Italy Sheet 144 - (9501 1: 100,000) was at ORVIETO Station awaiting the signal for departure. When the air raid alarm was sounded, the Station Master refused to let the train leave the station, but this order was over-ruled by the German O.C. Troops (Appendix "E"). The train was very long and when it arrived at the bridge it was considerably slowed down by the steeply inclined track leading up to the bridge. When the tractor engine was about half way across the bridge the first wave of bombers came over the target area. The PAGLIA bridge which is about 10 Kms. (6½ miles) from ORVIETO station, is a stone viaduct about 700 feet long, 24 feet wide carrying a single track, and over a considerable part of its length some 90 feet in height. The first stick of bombs released did not hit the bridge, but the blast caused damage to the passenger carriage the windows of which were shattered. The train came to a stop, the engine driver shut off the current and ran far shelter down the embankment and under the bridge leaving more than 1,000 people to their fate. (Appendix E). A second wave of bombers came aver and although again the bridge was not hit some of the box-cars containing prisoners or war were so badly damaged by the blast, that the men in them escaped and tried to release their fellow prisoners in other cars (Appendix J). It should be remembered that all the prisoners were without boots or shoes and also that it was a bitterly cold day. The third squadron now attacked, repeatedly hitting the bridge and causing 4 cars to be thrown from the viaduct. As their couplings did not break they remained suspended from the portion of the train remaining on the bridge. One of the suspended cars caught fire, but it was not possible to give any help as bombs were continually hitting the target. A further two coaches, one containing prisoners or war and the other civilians, were blown off the bridge. Another box-car apparently through a direct hit, blew upcausing the four cars which were previously suspended from the train to fall in the river which at the time of the tragedy was so shallow that one could wade across. In all eighty-four planes came aver the target that afternoon. The attacking planes must have used delayed-action bombs, because at 15.00 hrs., one and a half hours after bombardment ended when Captain PANDOLFI who had come on the scene with his men, wanted to release prisoners of war still locked-up in cars remained on the bridge a terrific explosion blew up another car and thereafter several more bombs exploded causing damage and casualties. From this description it can be readily gauged that fatal casualties must have been very heavy. The statements by LISEI Roberto, CUTARELLA Giovanni and the Parish Priest MISCETTI (Appendices H, F and J) can be accepted as being very near the truth and that perhaps more than 400 Allied Prisoners or War lost their lives in this disaster. As it was always possible that a number of men, although wounded had been able to reach the surrounding hills, died and were buried there, I visited the hamlets in these hills. Some of these hamlets consist only of two or three farm houses and are not on the 1:100,000 map. Others are inaccessible even by Jeep. Once the bombardment was over the German guards who had climbed on the roofs of undamaged cars, opened a continuous rifle fire ori the Prisoners of War who were trying to escape across the surrounding open country. This also accounts for a number of casualties. I could not find any graves, nor did the villagers think that there were any. Most of them assisted escaped Prisoners of War to get to the next village and, in my opinion they were only too glad to get rid of the escaped men as a strong force of German soldiers, from AQUAPENDENTE, combed the hills and conducted a thorough search in almost every farmhouse. (Sh. 129 - ITALY 1:100,000- Map Ref: 2562). I thought that if a nominal roll could be obtained of either the Prisoners of War who were on the train or or prisoners in the Prisoners of War Transit Camp at FARA-IN-SABINA it would assist in identifying those Allied prisoners who are now accounted for. In ROME I interviewed the Italian Red Cross authorities, the International Red Cross authorities, the Prisoners of War information office at the Vatican City and even the Italian Ministry of War but without success. The Secretary of the International Red Cross informed me that as at that time FARA-IN-SABINA was a Transit Camp neither the Red Cross authorities nor their Staff were admitted, and that it is quite possible that when the German forces evacuated the area, they destroyed all documents, as had been the case with documents of other Prisoner of War Camps. On the 28.1.44 I heard that the Ponte di Paglia had been bombed and that a train containing a large number of POWs, civilians and Germans, had received several direct hits, and that a great number of casualties were expected. The number of wounded who subsequently arrived was far in excess of available beds, and those that could not be accommodated were directed to the German Military Hospital in ACQUAPENDENTE. (See Appendix B) The names of those that died of wounds were entered in the Hospital records, and the list is hereby produced (Appendix C). At that time we had an Italian residing in Orvieto who acted as interpreter; his name is MONCELSI PARIS. I acted as interpreter for the Civil Hospital authorities only, and questioned only the English and French-speaking wounded in order to obtain their names, numbers, ranks and places of birth. Whatever I know about the PONTE DI PAGLIA is hearsay. The list of wounded and of those who died is produced herewith. I know that on 7 February 1944 the patients who could be transported were taken away from this hospital and the Civil Hospital at ORVIETO, and transported to BASCHI STATION, 12 km. South of ORVIETO, where a hospital train took them to Germany. The others were directed to ALLERONA STATION, and from there were taken by ordinary train to Germany. I was a captain in the Fascist Militia, stationed at ORVIETO, and I reside at PALAZZO ONORI No. 10. On 28 January 1944 at 12.45 hrs., I was having lunch when I heard the drone of allied bombers and looking out of my window with the aid of binoculars I saw that the bridge was being attacked in force. I noticed that there was a train on the bridge , and although I did not know at the time that the train carried mostly POWs, I feared the loss of civilian life and intended to proceed to the bridge, in order to give assistance if such was required. I went post-haste to the barracks and asked for volunteers to proceed with me to the PONTE DI PAGLIA. Fourteen men answered my call, but then I had difficulties with the German officers who did not want to give me permission to leave; it was only when I insisted, stating that innocent Italian lives were in danger that I succeeded in leaving for the Bridge. At about 13.20 hours I arrived at the place of what can easily be described as a CARNAGE. Hundreds and hundreds of dead an wounded were strewn about and my men and I started to give what assistance we could, but it was a hopeless task as we were without medical supplies. I noticed that several boxcars were still standing on the bridge, and we started to open these; they were locked and we had to wrench off the locks in order to give the prisoners a chance to escape. When I tried to open a boxcar near the front of the train, apparently a time bomb went off and blew up the wagon; I was thrown off the bridge and seriously injured. I was in hospital for more than three months. There is no earthly doubt that more than three hundred must have lost their lives. Four cars were thrown off the bridge and two were on fire. We were powerless to assist the men locked up in these cars. On 28. 1. 44 at 12.30 hrs I boarded a train consisting of one passenger coach, two box cars with open doors and carrying a great number of civilians, and further freight cars padlocked and guarded by armed German guards, transporting P's O.W. When the train was on the point of departure the air alarm was sounded and the station master refused permission for the train to proceed. There was an argument between the Station Master and a German officer in charge, and the train had to leave. It was a very long train and when we arrived at the bridge the train went dead slow and when the traction engine was over the bridge there was a terrific explosion. I had previously jumped off the train and run for shelter, under the arch of the railway bridge. I saw that the centre of the train had received a hit, and four coaches, two on each side, were thrown off the bridge and two were on fire. Thereafter it rained bombs, and several cars must have received hits as the debris was thrown in the air, and bodies, steel and wood in great quantities fell on the west side of the bridge; there must have been hundreds of dead. During a lull in the bombardment some civilians and I tried to help the wounded who were lying all around us, but the Germans shouted that we were not to touch anything. Some guards who were on the roof of the coaches at the rear end of the train, shot at us; we ran back for shelter as more planes were coming over. The bridge received more direct hits and one boxcar was thrown off the east side of the bridge and hung suspended from the remaining coaches of the train. Of what happened thereafter I have only vague recollections as I was too shaken and shocked to pay any more attention; all I wanted to do was get away. I was one of the labourers who were forced by the Germans to work on bridge repairs. We were fifty men from different villages in the vicinity of ALLERONA. When the planes came over we sheltered under the bridge; first the bombs fell some distance from the bridge, but later direct hits were scored. There was a train standing on the bridge and we could hear the men, who were locked up in the freight-cars, shout, but we could give no assistance. The train was hit several times and four cars were blown off the bridge. I could see that one was burning. I was too frightened and do not remember what happened. When the bombardment was over, the Germans would not allow us to give any assistance. Some German Red Cross personnel, some German soldiers and the parish priest Misceti, attended to the wounded. The next day I, and many others, buried the dead who were lying about in hundreds. They were thrown into craters and hastily covered with earth and debris. I estimate that the number of dead we buried that day was between three hundred and fifty and four hundred. They were mostly lying on the east and west side of the bridge and on the left bank of the river. This is all I know of this bombardment. I was working for the Germans on the north side of the bridge when I heard the noise of aeroplane engines, and as the Allied planes were bombing almost every day I knew that we were in for another bombing and I sought shelter under the bridge. I noticed that a train was approaching from a southerly direction (from ORVIETO). The first bombs released by the planes did not hit the bridge, at the time I noticed that the train was about half way across the bridge and moving very slowly, when the engine had crossed the bridge the train stopped, and a few minutes later the driver sought shelter where I was under the bridge. The noise of the explosions, the smoke, the cries of the wounded, made that I cannot remember any more of what happened afterwards. The next day I assisted in the burial of the dead, the parish priest wanted to take the personal belongings of those to be buried but the Germans prevented this. I also think, but am not certain, that the German dead were also buried together with the others. I was certain that we buried more than 300 dead. Despite his attention to detail the parish Priest of Monterubiaglio, don Marzio Miscetti, got the date wrong: On the 29 January 1944 at 1330 hours a train containing about 1,000 prisoners of War who were captured at Tobruk in 1942 and were en route from the Prisoners of War transit Camp at FARA-SABINA halted on the railway bridge over the river PAGLIA. When the first wave of bombers came over fortunately they scored no direct hit on the train but the blast of the explosion was so strong that some of the box cars, in which the P's.O.W. were locked up, burst open, thus releasing the men who immediately went to other padlocked cars and tried to open them and free the prisoners. Although the second wave of bombers which came over did not obtain direct hits, the blast of the explosion and falling debris and rubble caused the deaths of a hundred men. The third squadron of bombers got direct hits on the bridge in the center of the train and the bridge collapsed in three places. The fourth raid caused most damage by its delayed action bombs which exploded causing the deaths of more than 300 men and also a large number of casualties, the larger part of which were more slightly wounded. The wounded were immediately attended to by us and German Red Cross personnel, they were later removed to the Military Hospital at ACQUAPENDENTE and the Civil Hospital at ORVIETO. The dead, about 300 British, Blacks, Algerians and French, were buried in the bomb craters. I wanted to bury the dead in the Civil Cemetery of Orvieto but for this permission was refused. Even the hundred German dead were buried with the killed P.O.W. in common graves. Almost all the dead were buried on the left bank of the river PAGLIA. In order to comfort the wounded that same evening his Excellentis the Bishop of Chiusi and other high ecclesiasticals came to visit them bringing them gifts and comforts. I must mention the personnel of the station and also Signora BERNANSINI. I arrived at the scene of the disaster five minutes after the raid had ended and the first thing I did was take all particulars from the P's.O.W. but I was ordered away by a German Lieut. so I could only take name and address of N.O.K. More air raids and bombing of the bridge took p lace in February, March, April and May thus destroying whatever remained of the buried. Now all that one can find are pieces of bone and clothing. The results may be found in file 16-501-4 Mediterranean Theater of Operations. I was captured near Cassino, Italy on 7 January 1944 and taken by truck to a collecting station near Rome, Italy. I stayed there until about 28 January 1944 when I was taken by boxcar to Stalag 7A, Munich, Germany, arriving there about 1 February 1944. I was there until about 5 April 1944 when I was taken by boxcar to Stalag 2-D1 Hammerstein, Germany, arriving there about 10 April 1944. 1 remained there until about 24 April 1944 when I was taken by coach to 1668 Kommando, Stolp, Germany, arriving there about six hours later. I remained there until 18 February 1945 when the Germans started marching us eastward because of the approaching Russian armies. We marched until 8 April 1945 when we were liberated at Tangermunde by the American Fifth Armored Division. Q. Do you know of any mistreatment of American prisoners of war at any time? A. Yes, the train in which we were being taken, from Rome, Italy to Munich, Germany was exposed to an Allied bombing attack near Florence, Italy. Q. Will you state in your own words what you know of this incident? A. About 800 American prisoners of war, including myself, were loaded in boxcars near a collecting station outside of Rome, Italy on about 28 January 1944 and were being taken to Stalag 7A, Munich, Germany. On about 28 January 1944, about eight hours before we got to Florence, Italy, Allied bombers started bombing the train just as it was going over a bridge which was about as long as four of the cars. I think the locomotive was knocked out by the first bombs for the train stopped on the bridge. The guards made no attempt to release us but ran off trying to find cover. Q. Did this bombing result in any casualties among the American prisoners of war? Q. Do you know the names of any of the Americans killed by this bombing? A. No, I do not. Q. In your opinion, was it possible for the Germans to have protected the American prisoners of war from this bombing? A. Yes, the train could have been marked and if the guards had let us out of the boxcars not as many of the men would have been killed or wounded. However, the terrain around where the incident occurred did not offer much protecting cover and the ones in the boxcars on the bridge would not have had a chance to take cover. Q. What other prisoners were with you on the trip? Q. Can you identify any of the Germans responsible for this incident? This incident happened on about 28 January 1944 when I was being transported together with other prisoners in boxcars from Italy to German prison camps. We were locked in boxcars and there were two guards riding on the roof of our car. The particular car in which I was riding was well forward on the train, and as we passed over a bridge below Florence, Italy, American bombers hit the train and bridge together. There was one car of ammunition on the bridge at the time of the bombing and this kept exploding. It was estimated that about 300 British and South African prisoners were killed by this bombing as they were riding in the central and rear part of the train. The American prisoners in my car escaped from the boxcar when the train stopped and ran up to the surrounding hills where we remained for about ½ day while the wreckage was being cleared. The Germans then brought us back and unloaded at Florence where we were reloaded in coaches to continue the journey. One of my fellow prisoners who experienced this incident was Pvt. Allen Kroll formerly of Co. I, 168th Inf. Regt., 34th Division, whose home is in Racine, Wisconsin. I can only recall the commissioned officer in charge of the prisoner guard. I do not know his name but he was short and fate weighed about 200 pounds) about 40 years of age, and wore the greenish uniform of the transportation branch of the German army. I, Peter J. Stefanscik, Agent, Security Intelligence Corps, certify that Russell Eugene Kurzhall Pvt 37548471, personally appeared before me on 10 August 1945 and testified concerning war crimes; and that the forgoing is an accurate transcription of the answers given by him to the several questions set forth. I was captured in Tunisia on 27 December 1942. I was taken to prison camp 98 in Sicily where I stayed from 1 January 1943 to 21 January 1943 then I was at camp 59 Port of St. George, Italy from 24 January 1943 to 14 September 1943, then I escaped and was at large in the mountains of Italy until my recapture on 16 January 1944. From that date until 5 February 1944 I was in the Fascist civilian prison in Ascoli. Then I was in three different camps, the numbers of which I do not recall, for a period of approximately 15 (?) days and ws sent to Prison Camp 82 in Italy where I spent the entire month of March 1944. From there I went to Stalag VIIA near Munich where I spent the entire month of April 1944. Then I was at Stalag IIB in Germany where I spent almost the entire month of May 1944. From there I went to Stalag IIIB about 35 miles Southeast of Berlin where I sayed from 1 June 1944 to 15 January 1945. then I was at Stalag IVD near Annaburg from 17 January 1945 to 2 February 1945 on which date I was repatriated through Switzerland. In the early part of 1944 we were travelling by train to Northern Italy. At this time a raid was made by Allied planes on an important railroad bridge in that vicinity which was just south of Florence. The German guards and German train crew deserted this train and ran to shelter leaving part of the train parked on this particular bridge and the remainder of it on solid ground at the end of the bridge. In any event the train was hit by bombs and there were many casualties resulting from this bombing. I saw a good many casualties who were wounded, however, the only one I know was an American soldier named Borland, (see note) who I think, had been with 18th Infantry Regiment, his arm was severely burned. I heard that there were around 300 prisoners killed as a result of this bombing, I cannot verify that for sure as it was just common talk at the time. It would appear that the American angle on the bombing was that the Germans could have prevented the injury and death of some of the POWS on the train and were therefore guilty of a war crime. At no time was the incident considered to be an error on their part. That an investigation was impracticable is not borne out by the investigations carried out by the South Africans and reported above. The implication was that it was impractical to try to trace the German troops involved. What happened to the bodies of the two men who were re-buried by 160 Railway construction company? Were they ever properly identified? Who were the Italian civilians on the train? If they were in two cars their number would have been around eighty. Why were they travelling in freight cars? Were they all killed or were some taken to hospital? Did any manage to escape? Why has no-one taken any interest in them and why have they not been commemorated?